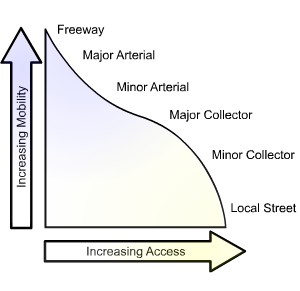 Access Management provides an important means of maintaining mobility. It calls for effective ingress and egress to a facility, efficient spacing and design to preserve the functional integrity, and overall operational viability of street and road systems. All of the three benefits cited above are essentially the result of minimizing or managing the number of conflict points that exist along a corridor. Imagine the two extremes of the same corridor. In the least intrusive example, no minor-street conflicts exist. Traffic flows freely down an unencumbered corridor "pipe" influenced only by density, weather, and integrity of the roadway. When minor-street conflicts (i.e., "laterals") in the form of driveways and streets are introduced, the mainline flow must adjust speeds and sometimes lanes to avoid all manner of delay and conflicts introduced by the myriad combination of slowing, turning, merging, entering, and stopped vehicles. In many locations, it is necessary to completely stop the mainline flow (via signals) so the minor-street vehicles can even gain opportunity to enter the flow. In short, steady progression is interrupted, and often at uneven intervals.